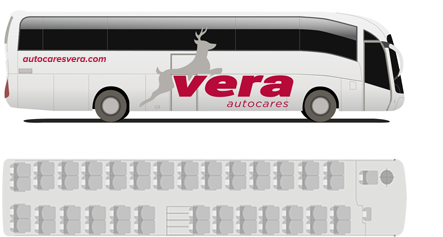 Most of our buses and minibuses are from Scania, Iveco and Mercedes brands. The bodies are mostly Irizar and Sunsundegui, and the small vehicles are generally Ferqui. All our vehicles are equipped with seat belts on all seats, arches of security no overturned, safety brakes ABS and antiskid ARS and body resistance to lateral and frontal impacts. All vehicles in our fleet are equipped with the most advanced equipment to ensure the safety and comfort. Our vehicles generally have reclining seats, seat belts, individual lights for reading, intelligent air conditioning, WI-FI, WC or mini-bar fridge among other things. A long coach journey is not necessarily an uncomfortable ride. With long distance coaches, traveling is much safer and comfortable. In the new 48 seats coaches the distances will be ‘’reduced’’ thanks to the latest technology and advanced equipment. Comfort and safety in multipurpose vehicles of 54 seats to suit the requirements of transportation for medium distance trips. In AUTOCARES VERA we offer for your service a fleet of vehicles for medium distances with the latest technology in safety and comfort. The flexibility and agility provided by the smaller size of these vehicles is the perfect proposal for small groups. 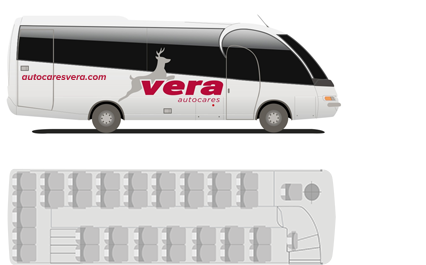 A fleet of the latest generation of 25 or 35 seats, equipped with the latest technology. 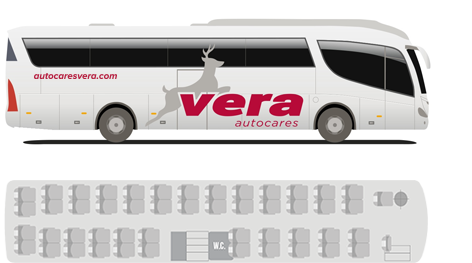 AUTOCARES VERA has its own facilities where our mechanics do all maintenance of the fleet of coaches. The rigorous daily monitoring of each of its units provides results of a minimum annual rate of breakdowns. To complement the activity of road passenger transportation we offer transportation services adapted for disabled people, which aims to promote autonomy and facilitate a normal life for people with disabilities or mobility problems. of wheelchairs without any technical obstacles. Almost all of our bus fleet is adapted for those who have mobility issues so that there is no problem in traveling. On the other hand, AUTOCARES VERA’s staff is familiarized with the specific work of this type of services, such as handling lifts, wheelchair anchoring, fastening seat belts and treating people with different disabilities.